Main Characters: Caspian, Edmund, Lucy, Eustace, Aslan, Drinian, Reepicheep, Ramandu and The invisible men. Description of one of the main characters: Reepicheep is a very brave Narnian mouse. It can talk. It goes bravely to the end of the world and reaches Aslan's world. It is very loyal to Caspian. It is a very adventurous mouse. Whom I like and why: I like Caspian. He is brave and generous. He is kind to people of his kingdom. He is a fair and just king. He is a good friend of Edmund, Lucy and Eustace. He is very patient. Caspian is Aslan's favourite king of Narnia. Whom I dislike and why: I dislike Eustace Scrubb as he is very silly. He is very selfish. He is not very brave. Eustace does not adjust with anyone. He is the cousin of Edmund and Lucy. Setting/Theme of the story: Lucy and Edmund are sent to their cousin's house to spend the holiday. In Lucy's room there is a picture of a ship sailing. Suddenly all three of them, Eustace, Edmund and Lucy, go into the land of Narnia through the picture. 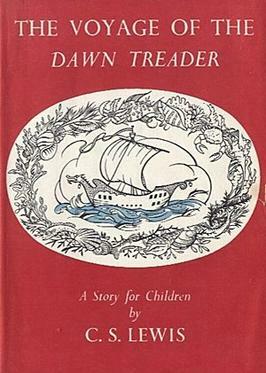 They find themselves in the ship of Caspian, the Dawn Treader. They all sail to the east where the world ends. They go to look at the end of the world. They have many adventures like meeting all the invisible men of an island. They go to Ramandu's island and leave Reepicheep to go further east. Drinian, the captain of the Dawn Treader brings the three children back to Lucy's room safely. Part I enjoyed the most: I enjoyed the part when Caspian and the others in the ship escape from the governor of the lone-islands. Different ending: Prince Caspian and the others find Aslan's world. It is near the sun. It is bright and beautiful. Aslan gives it to Eustace who rules it wisely.